TWO MORE WOMEN have accused embattled US Senate candidate Roy Moore of sexually inappropriate conduct, media has reported, but the Alabama politician gave no sign of dropping out of the race as his campaign denied assault allegations. The website AL.com reported that a woman from Moore’s hometown of Gadsden, Alabama said Moore groped her behind when she visited his law office in 1991. 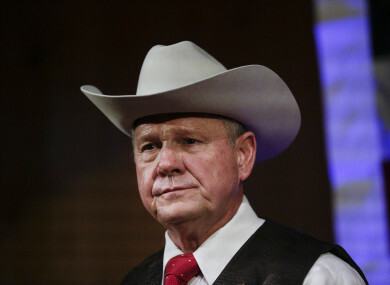 The media outlet also said another woman claimed that Moore asked to date her in 1982 when she was just 17 and he was in his mid-30s, and that Moore told her he went out “with girls your age all the time”. The allegations are the latest in a series of explosive claims against Moore, a conservative former Alabama Supreme Court judge. Five women have previously come forward to accuse Moore, including a woman who claimed he initiated a sexual encounter with her decades ago when she was 14. Moore, now 70, is the Republican nominee in a special Alabama election 12 December to fill the seat of now-Attorney General Jeff Sessions. Appearing before media in Alabama, Moore’s lawyer Phillip Jauregui denied the allegation of one accuser, Beverly Young Nelson, who this week said Moore sexually assaulted her in his car in 1977 when she was 16. Nelson showed reporters her yearbook that Moore apparently signed, as evidence that they knew one another. Jauregui said the campaign wants the yearbook released so that a handwriting expert can determine, “is it genuine or is it a fraud?”. In the new sexual harassment allegation detailed in AL.com, which includes the Birmingham News and Huntsville Times newspapers, Tina Johnson said Moore made her feel uncomfortable during a meeting in his office when he “kept commenting on my looks”. Johnson was then 28 and in a strained marriage, and was visiting with her mother who had hired Moore to handle a custody petition involving Johnson’s son. As the women left Moore’s office, Johnson said, he groped her buttocks. “He didn’t pinch it; he grabbed it,” she said. The second woman, Kelly Harrison Thorp, said she he was just 17 when Moore asked her out. She declined. In a statement released on Twitter yesterday, Moore denied the allegations made against him, claiming that they were a “desperate attempt to smear my character and defeat my campaign”. “I have been married for almost 33 years to my wife Kayla. We have four children and five granddaughters,” he said. Moore said that his team is in the process of investigating “these false allegations” to determine their origin and motivation. “In her accusations, Nelson did not mention that I was the judge assigned to her divorce case in 1999, a matter that apparently causes her no distress at a time that was 18 years closer to the alleged assault,” Moore said. “Yet 18 years later, while talking before the cameras about the supposed assault, she seemingly could not contain her emotions,” he said. Are we at a stage in American politics in which false allegations can overcome a public record of 40 years, stampede the media and politicians to condemn an innocent man, and potentially impact the outcome of an election of national importance? When allegations of events occurring 40 years ago – and never before mentioned during a 40 year career of public service – are brought out and taking seriously only 30 days before a critical election, we may be in trouble as a country. Mainstream Republicans in Washington have made it clear they want Moore to exit the race. President Donald Trump has appeared to equivocate on the matter, saying last week that Moore should step aside if the claims proved true while adding that a mere allegation should not destroy the Alabama politician’s life. Yesterday, Moore tweeted that “we will not quit” and said, “Dear Mitch McConnell, bring it on”. © – AFP 2017 with reporting by Hayley Halpin. Email “'Bring it on': Republican candidate Roy Moore 'adamantly' denies latest allegations”. Feedback on “'Bring it on': Republican candidate Roy Moore 'adamantly' denies latest allegations”.